Two General Electric UM10B "Caterpillar" engined Locos A-224+A-221 wait at Athinai station with train 1510, the early morning train to Larissa. 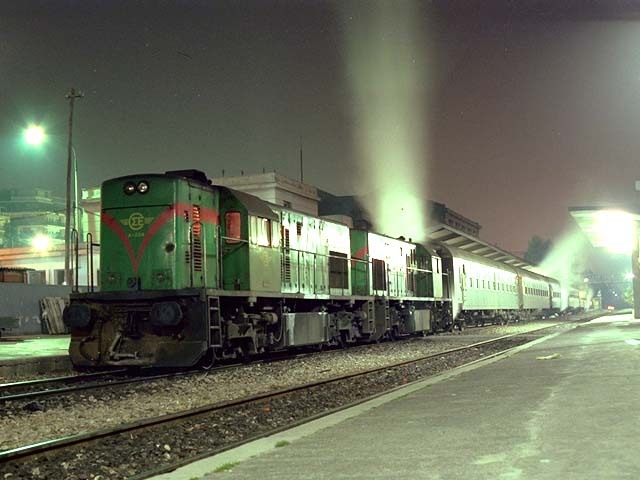 The picture was taken on February 21st 1989, both Locos are in the original green livery, the steam heating is leaking from the connections in this early morning photo. A-229 at Bralos. 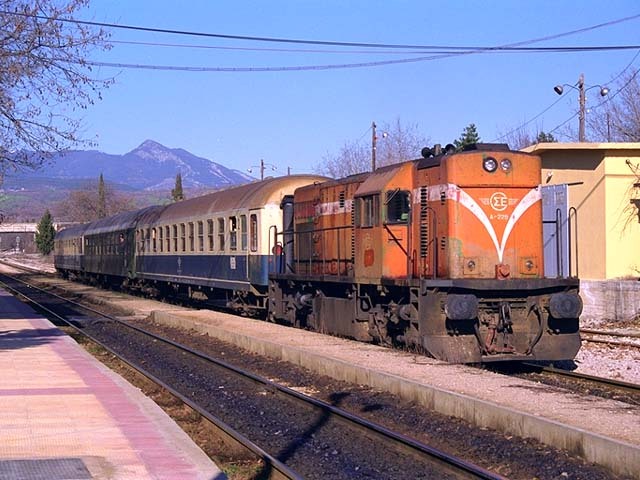 Currently only A-223/4/9 remain in use, only passenger with a two return daily trains from Lianokladi - Stylis. 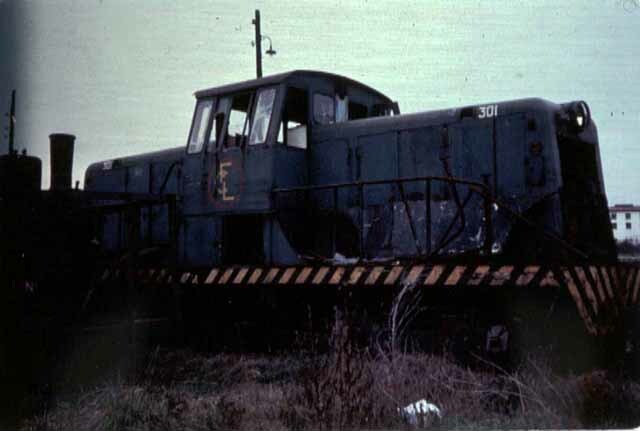 All remaining Locos are abandoned in a poor condition at in the yards at Agios Ioannis, in Athens. 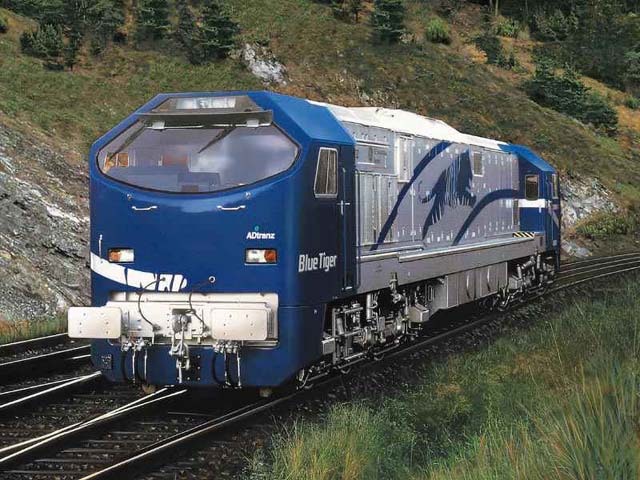 ADtranz built prototype Loco DE33AC "Blue Tiger" was built as a demonstrator, fitted with FDL-12 engine of 3200hp. 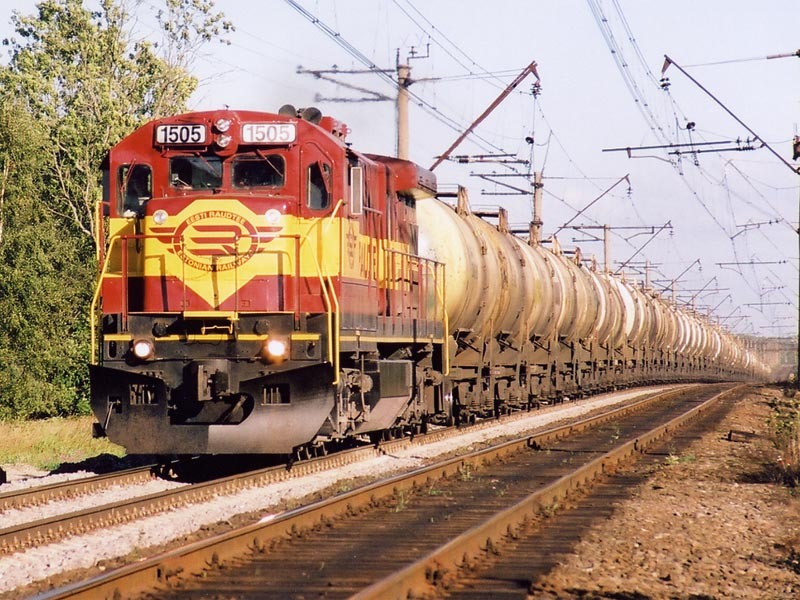 Tested on various line by the DB, it is currently used by HGK for hauling their trains over various routes in Germany. A large fleet of ex US GE's (both C36-7 and C30-7A) are now in service in Estonia, lots of photos here on my Estonia GE page!! 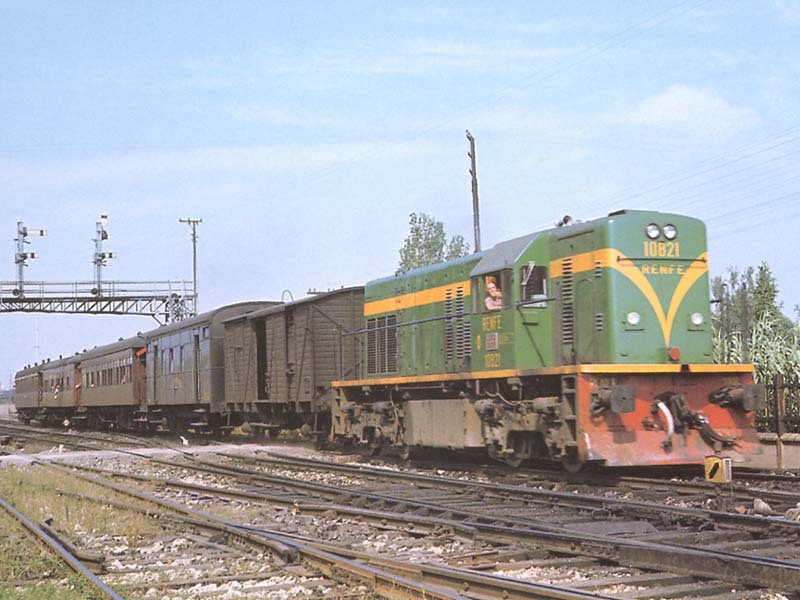 RENFE 10821 is seen arriving at Tarragona in 1969 with a Local "Omnibus" passenger train. Now this area is all electrified, and semaphore signals are long gone! 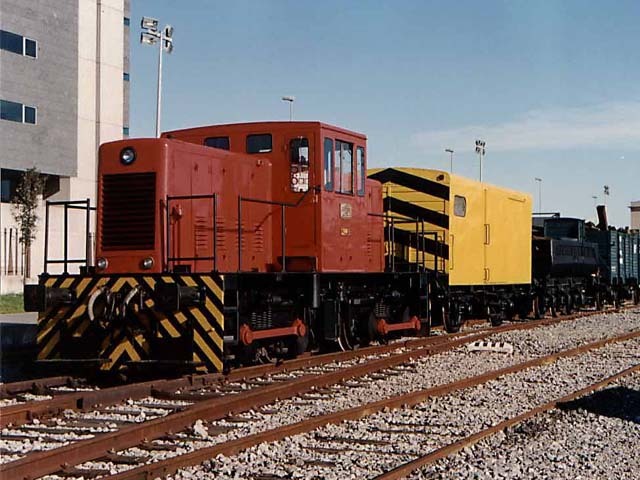 Photo from "Locomotoras Diesel II:. UM10B 308.011 is seen stabled at Murcia del Carmen in the bright sunshine. 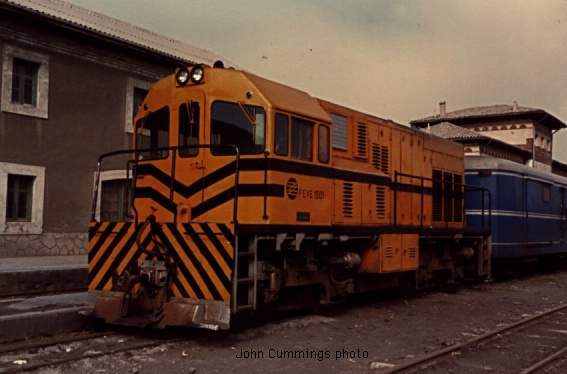 The small Locos were originally fitted with train heating boilers for work on lightweight passenger trains. Mainly based in central and northern Spain. 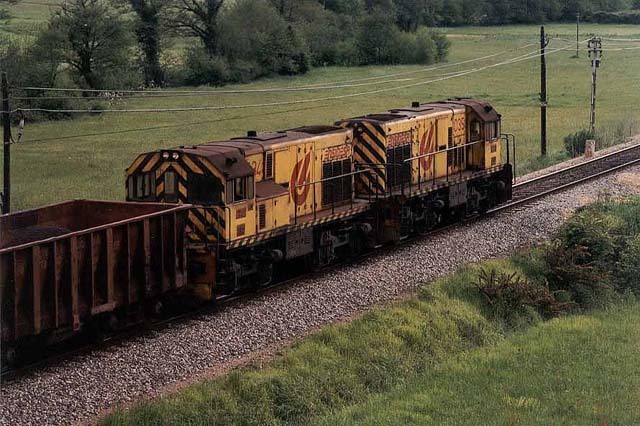 Nowadays used as heavyweight shunting Locos, being rated at 1,050hp. A number are now painted in a new red and silver livery. 2nd February 1986. 308.017 in preserved form. 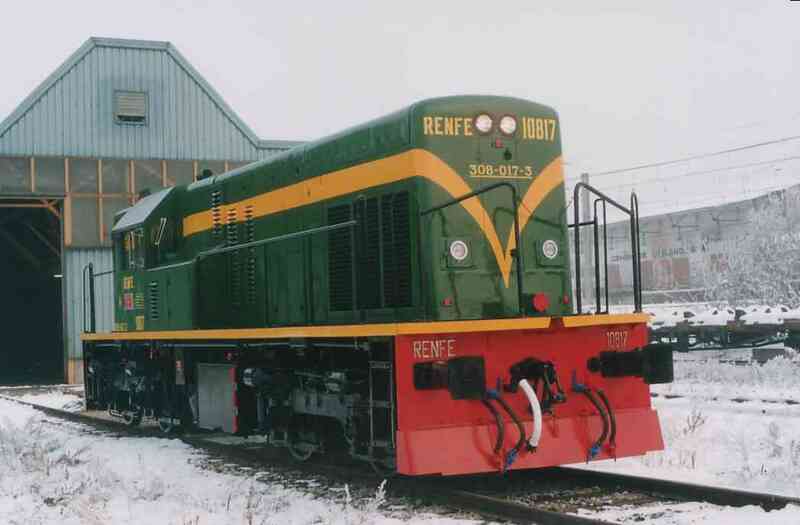 This locomotive was modified during its operative life by RENFE and added air operated brake system together with vacuum brake. The locomotive belongs to Railway Museum and is hired to ARMF (Historical Rolling Stock and Locomotive Preservation Society) for preservation purposes. 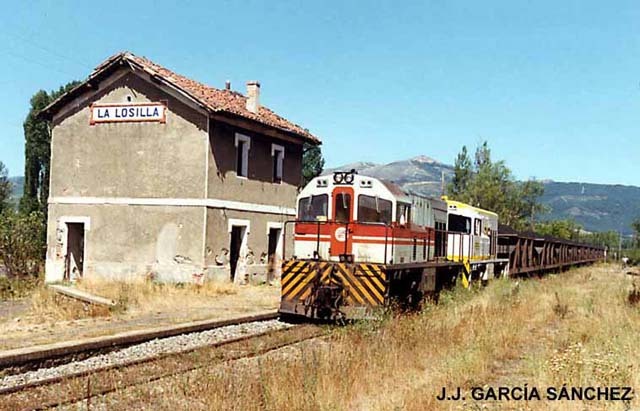 A pair of FEVE 1500's at La Losilla station of the León - Bilbao line of FEVE, with a coal train for Guardo. One in the older red livery, the other in the new yellow livery. Photo taken on 22 August 1990 by J García Sánchez. 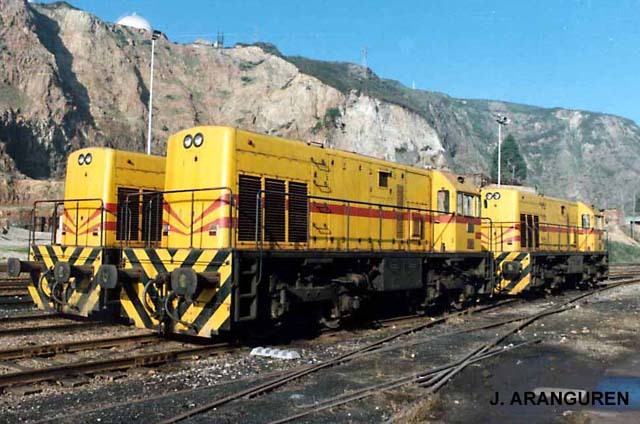 Three of the Junta de Obras del Puerto de Gijón, built by Babcock & Wilcox waiting duties in the yard of the Gijón docks. Summer 1975. Photo taken by J Aranguren. 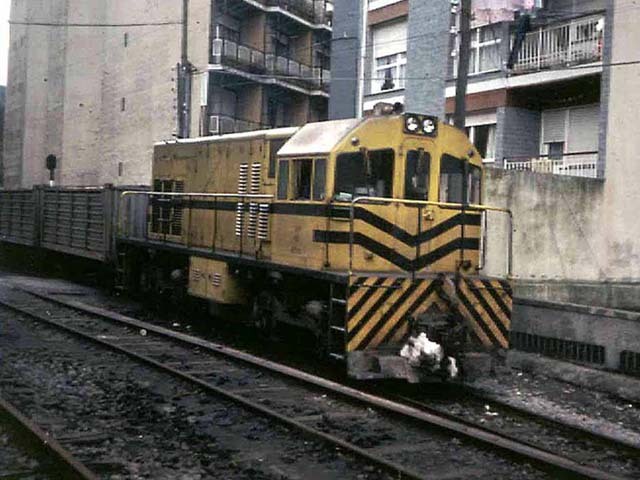 One of the former Ferrocarril de La Robla meter gauge U10B Locos, now numbered as FEVE 1501 seen on a FEVE narrow gauge passenger train. A private U10B, of the Robla system. 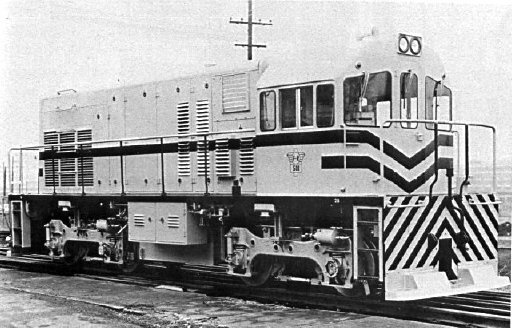 An early photo of 1923 built electric locomotive Norte 6006. 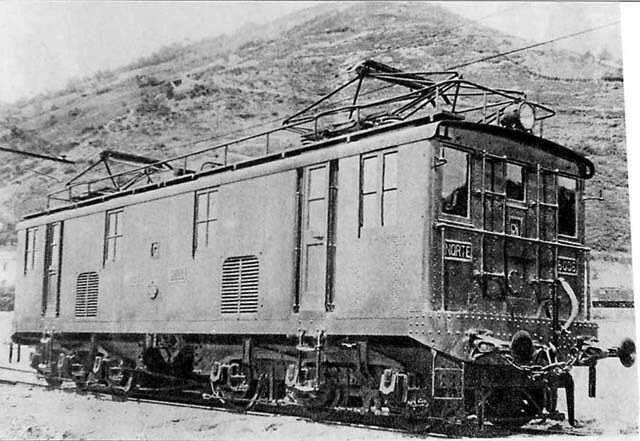 This type of Loco was used from 1925 to 1955 in the high gradients of the Pajares Pass, in the Norte line León - Gijón. 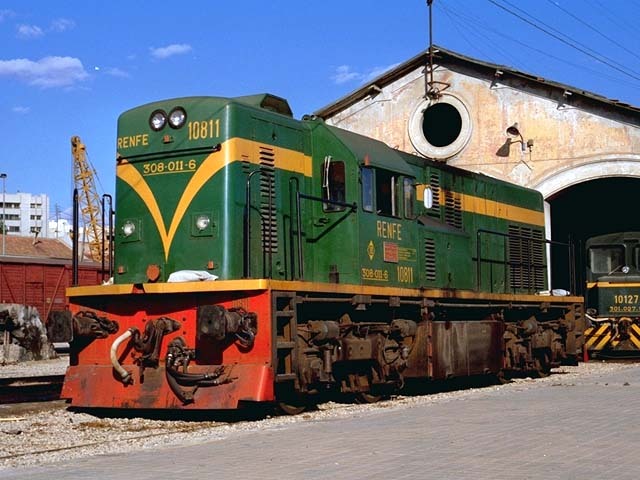 Photo from Museum del Ferrocarril de Asturias collection.